AOS PÉS DO SANTA MARTA. 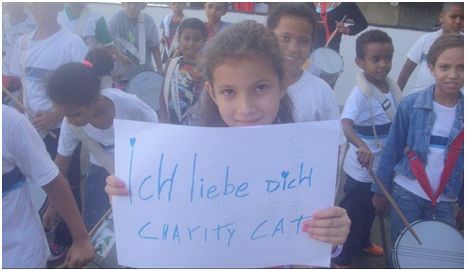 In 2012, Charity Cat e.V. 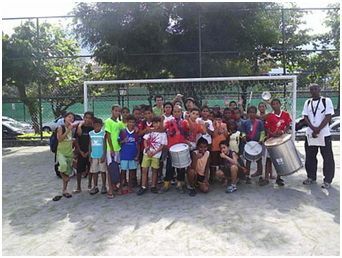 continued to support its Brazilian project in Santa Marta, Rio de Janeiro, through ONG Social Attitude. ONG Social Attitude aims to improve the life of citizens living in low-income communities like the residents of the Santa Marta community. This is done through various social and cultural offers such as music projects. One of their main goals is to build a better future for the children and youngsters living there, knowing that they can´t change the past, but can help setting the course for a better future. At their music school, for example, the kids can attend music lessons and are offered homework support as well as something to eat. 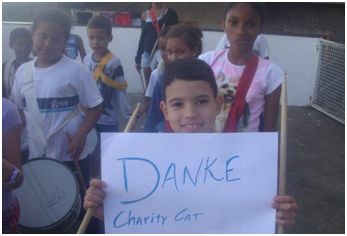 Charity Cat’s contributions were used to help finance, amongst others: new musical instruments for the children, clothes, toys, books and school materials, and a new water tank.